We stayed at the Andaz for 3 nights in a very cold January, we arrived at lunch time and was checked in immediately. The check in was informal and personal – the staff were smart/casual and carried ipad’s We were offered a drink while we waited and then taken to the room where all the features were explained . We had a large suite with a sitting area, mini kitchen including dishwasher, microwave and Nespresso coffee machine. All the soft drinks and snacks were complimentary and were replenished daily. We arrived after a heavy snowfallbut it was still nice and cosy in the hotel. The bathroom was ultra modern with two sinks, rain shower (with seat and foot bath) but no bath. Everything was immaculately clean and well presented, the windows were floor to ceiling to appreciate the city views. Blackout blinds and lamps were all operated by touch switches at the bedside. There were slippers, robes and a safe, we requested a kettle and this was brought up to us immediately. The huge king bed had crisp white linen and fluffy pillows. The hotel is on 5th Avenue and 42nd street, right opposite the Public Library which is an iconic building in Midtown. It’s ideally located, only a short walk to Times Square, Grand Central Station, Central Park and Rockefeller Plaza and of course all the shops. The city was still dressed for the festive season, with the famous huge tree at Rockefeller, it was freezing with plenty of snow on the ground which added to the wintery atmosphere, but it did stop us doing as much walking as we normally would as it was so bitter. Taxis were available right outside the hotel, we had a Lincoln car to the theatre one evening which was a bit more expensive but more comfortable for 4 people. We got our reduced priced tickets to Cinderella at the TKTS booth in Times Square, we had to wait in line for about 30 minutes but there was plenty of seats available for all the main shows on Broadway. The booth opens at 3pm for performances that evening. We ate in the restaurant in the hotel ‘The Shop’ several times, it was easy and convenient and very tasty. It seemed popular with locals as well as hotel residents. The staff were helpful at recommending restaurants too, we went to a steak restaurant overlooking the Rockefeller called Del Friscos which was excellent – perfect New York style steaks and sides about 10 minutes walk away. A bonus with the hotel was the daily complimentary wine reception which was served at 6, it wasn’t overly publicised but was a nice touch, especially with the high price of wine in bars in the city, it was a good stop before going out for the evening. 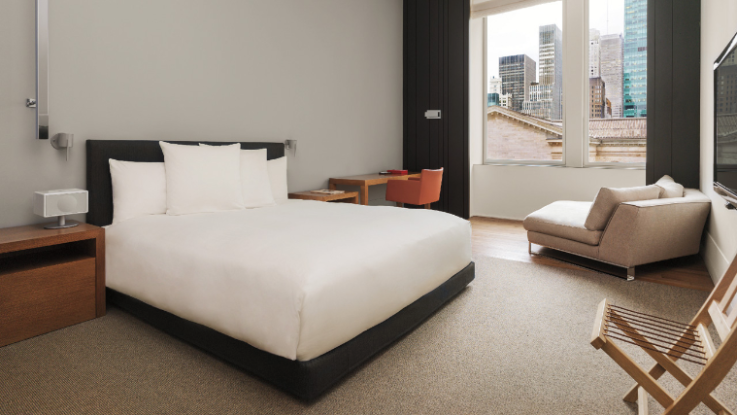 We would definitely stay at the Andaz again and would recommend it to others, we stayed at the one in London too a couple of years ago which was a similar high standard – modern and well equipped with helpful staff. From their welcoming Hosts that greet you with a glass of wine or a refreshing beverage to the made-in-New York goods sold at the shop, you’ll enjoy an authentic Big Apple experience when you stay at Andaz 5th Avenue. Relax without leaving our boutique hotel with a massage or spa treatment in your room or reenergize in our 24-hour StayFit™ Gym. Then, venture out to discover exciting things to do in midtown Manhattan all around our vibrant NYC hotel. Their knowledgeable Hosts can help you find exciting New York City attractions and sights just steps from our hotel near Times Square and Bryant Park. They’ll direct you to Manhattan’s most-toured landmarks or their own secret favorites. Whether you’re looking to sip the best Manhattan cocktails at local speakeasies or catch an award-winning Broadway show, our host will help you experience Manhattan at your pace. See the neighborhood through the eyes of the people who live here with these custom-made guides from our very own Andaz Hosts and Cultural Insiders. 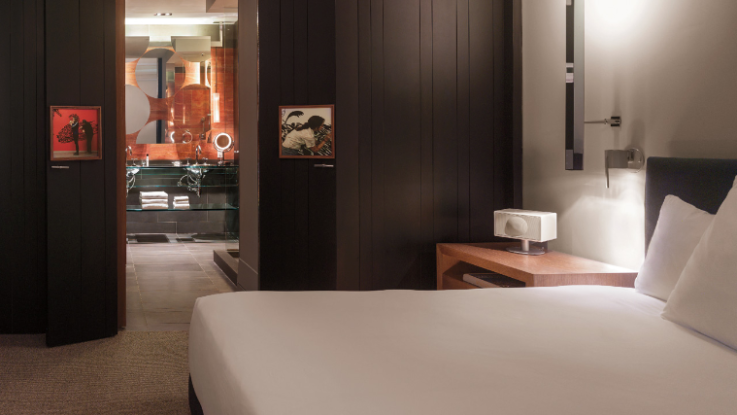 Renowned designer Tony Chi created loft-like guestrooms that complement the hotel’s unique design elements reminiscent of apartments in pre-war New York. Chi’s serene suites are inspired by the neighborhood and feature pre-war subway lantern light fixtures. Steel-blue wall decor and black shutter doors feel like the ultimate loft apartment. Relax in some of the largest hotel rooms in New York City with 12’ floor-to-ceiling windows and views of 5th Avenue and the New York Public Library. Many of our residential-style suites offer private balconies or landscaped terraces. Located on 5th avenue at 41st street, Andaz 5th Avenue is in the hip Bryant Park area of midtown Manhattan directly across the street from the New York Public Library. Guests will enjoy easy access to iconic New York attractions, like Times Square, Grand Central Station, Empire State Building, Herald Square and the Theater District. We are within walking distance to fashionable 5th Avenue shopping. From the moment you enter our boutique hotel, you are welcomed with 14-foot murals by Carlos Capelán, which glow like fire through the windows on 41st Street. But we don’t just want you to look at beautiful things at our hotel on 5th Avenue in NYC– we want to let you live the beautiful life Andaz exudes. As part of that promise, we offer amenities that include Wi-Fi, complimentary welcome drinks and snacks from our mini-bar and 6,400 sq. ft. of dynamic meeting and event space.